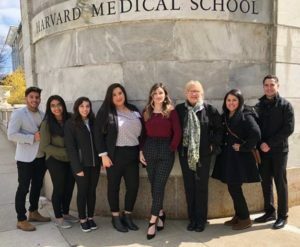 On Sunday, April 8th, seven DC3 students attended the New England Science Symposium at Harvard Medical School in Cambridge, Massachusetts. The DC3 Bridges students are graduating in May of this year and transferring to K-State to do research with the Developing Scholars Program this summer. Professor Elizabeth Wallace accompanied the group. The students listened to presentations from scientists dealing with research in biomedicine. The keynote speaker was George Q. Daley, M.D., Ph. D. who serves as the Dean of the Faculty of Medicine and Professor of Biological Chemistry and Molecular Pharmacology at Harvard University. The Minority Faculty Development Program (Established 1990) of the Office for Diversity Inclusion and Community Partnership (Established 2002; originally named Faculty Development and Diversity) sponsors programs for the development of Harvard Medical School faculty and trainees, with an emphasis on mentoring and leadership, as well as programs that are designed to reach out to the pre-college, college, graduate and postdoctoral populations with the goal of bringing outstanding students from groups underrepresented in medicine into the biomedical science pipeline. Left to right: Leonardo Garrido Alvarez, Laura Soto, Elena Carlos, Carmen Del Real, Yesenia Herrera, Prof. Wallace, Vanessa Hernandez and Bryant Avila.